Get the whole series! Earth’s Requiem, Earth’s Blood, and Earth’s Hope. Listen to Caroline McLaughlin narrate a snippet right here! 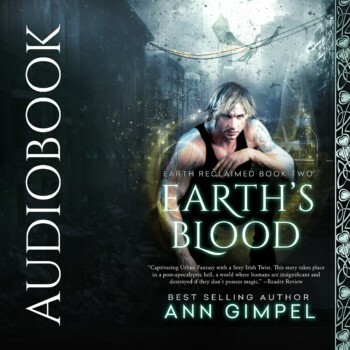 Earth’s Blood: Clinging to their courage in a crumbling world, Aislinn and Fionn vow to save Earth, no matter what it takes. In a post-apocalyptic world where most people have been slaughtered, the Celtic gods and a few humans with magic are all that stand between survival and Earth falling into chaos. The combination of dark sorcery leveraged by the enemy is daunting. Destruction is all but certain if the small enclaves of humans who are left can’t get past their distrust of the Celts. Captured by the enemy, Aislinn Lenear wonders if she’ll ever see her bond wolf or Fionn, a Celtic god, again. She’s had nothing but her wits to rely on for years. They haven’t failed her yet, but escape from her current predicament seems remote. An enticing blend of dystopian urban fantasy and romance, this second volume of the Earth Reclaimed Series provides fertile ground for Aislinn and Fionn’s relationship to deepen. Headstrong and independent, the pair run up against each other’s demands time and time again. Fireworks spark. In the end, they learn to savor every moment in a bittersweet world where each day may well be the last.